Check out the latest update in SQL Data Mask, a prototype that you can use to mask your databases for free with anonymized personal data. SQL Data Mask is the latest prototype to come out of the Foundry, Redgate’s research and development division. It copies your database while anonymizing personal data. You can use it to mask your databases right now, free of charge. In our last update, we shipped the first on-premises version of the app, previous versions only work in Azure in our foundry labs page. We’re working closely with a select group of people who are helping us test and iterate this solution; our goal is to make sure SQL Data Mask is able to satisfy your masking requirements. Based on the feedback you’ve given us, SQL Data Mask now has the ability to import/export masking configuration files, and we provide a masking report once a masking job is completed. To incrementally mask your database as you discover sensitive data. To source control your work and easily share it with your colleagues. This is the first effort towards that. You can now import and exporta masking configuration file that you can re-use, share and source control. Here is an example of how the [Person.Address] table has been updated to mask the address lines.You can see this change from a source control system once you export the masking configuration file. With GDPR around the corner and companies trying to keep audit trails, many of you have raised the importance of reports for auditing reasons. This is why we decided to provide a report capability very early in the development process in order to work with users and enhance this report. Once you complete a masking job we give you the ability to view the masking report as well as being able to export it to disk. Here are some other things we’ve done to make SQL Data Mask better. Added the ability to filter tables. Tables are now ordered by schema and table name. The list of tables is now scrollable. Login objects are now ignored. Mappings from database users to logins are now ignored. Added support for authenticated proxies. The two main things we want to work on and investigate are more flexible masking features and the ability to automate SQL Data Mask. 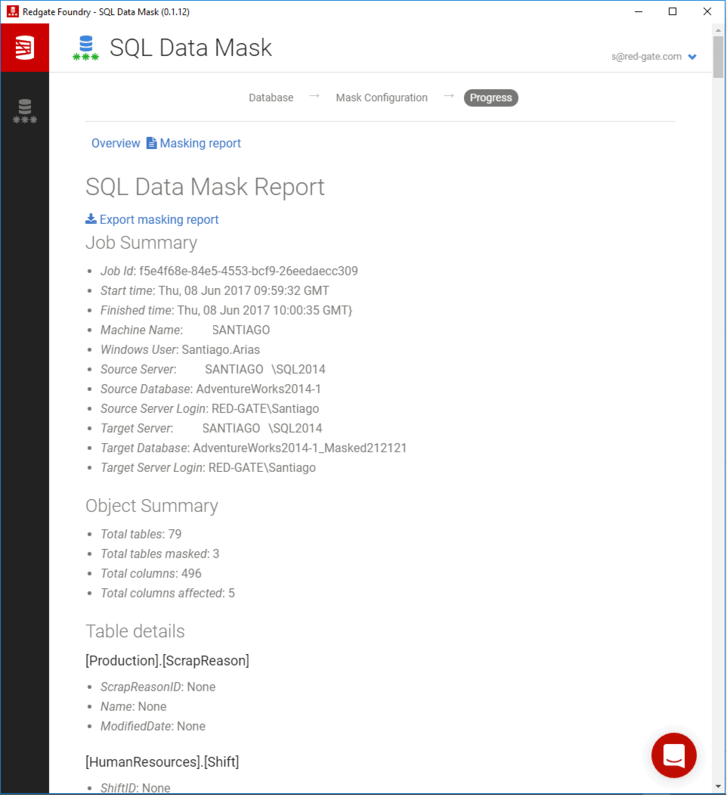 In the meantime, head over to Redgate Foundry and try SQL Data Mask now — we’d love to hear how well it masks your database for you. Published at DZone with permission of Santiago Arias . See the original article here.